What Hostages in Algeria? Manti Te’o Had a Composite Girlfriend! Maybe it’s a Hawaiian thing to make up girlfriends. Obama did it. He had this composite girlfriend in one of his books. This is an amazing story. And I’ll tell you what, if this keeps up it’s gonna eclipse Lance Armstrong on Oprah tonight. 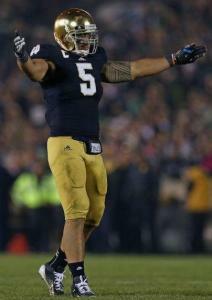 Manti Te’o who is said to be a great, very high draft prospect, National Football League, coming out of Notre Dame. Apparently, he had a multiple month-long relationship with a woman he called a girlfriend. Never met her, but talked about kisses and so forth. A running back for the Arizona Cardinals, also tweeting online that he knew the woman, described her appearance, but she never existed. Everybody involved says she never existed. They don’t know if he made it up and was living a lie or if he was hoaxed by people. If he was hoaxed, he totally fell for it and had a relationship with somebody pretending to be this woman online, and it got very serious. What do you mean, the Algerian situation? What Algerian situation? There is nothing about that on TMZ. I don’t know what you’re talking about. There’s nothing about that on TMZ or Entertainment Weekly. Algeria? What, there’s American hostages there? Oh, gee. Well, that means Obama’s gonna be flying off to a fundraiser in Vegas. We have hostages somewhere and, well, that’s what that means. That means there’s gonna be a fundraiser and parties and stuff in Las Vegas. That’s what that means. Have they found a video yet to blame it on? They haven’t? You’re kidding me! We got American hostages in Algeria, and there’s no video to blame for this? Well, I do know that Obama’s gonna be heading to Vegas. That’s a lock. But, seriously, folks, there’s nothing about that on TMZ or at Entertainment Weekly. I’m just now being told the fate of the seven American hostages is still unknown. You know, if Obama had just — executive action yesterday, that’s a new word for him — executive action outlawing hostage taking in his fatwas yesterday, it wouldn’ta happened, right? Outlaw hostage taking. Now we have Manti Te’o. Let me swerve into that. Manti Te’o. This story, this is impossible to get your arms around. As I understand it, there are three possibilities in this thing. Most people are confused, and that’s why they’re tuned in here, ’cause we’re zeroed in on pop culture news. People want to find out: What is this Manti Te’o story anyway? I looked at various reports of the story today, and I must tell you (again, a reflection of modern journalism) that I don’t know much more about this story than I do from reading the headline. But I dug deep, and it seems that there are three or maybe four possibilities here to explain what happened. We’ll get into those when we get back, but let me ask a question for those of you who have read enough. This hoax, if it was a hoax… See, one of the theories is that Manti Te’o willingly participated in this. Well, look, folks, you know what the media machine is today. You know the quest for fame. You know how quickly kids pick things up. What is the message our country sends? What is one message among many? You can get famous, that you can become well known and get rich if you have a story of heroism about you, if you’ve overcome long odds, if you have overcome great dangers, if you have survived and triumphed over great loss. We also have kids who are very up to speed on the fact that there are spin doctors in this country, that there are crisis managers, and that entire stories can be spun. Entire intricate webs of deceit can be created in order to create a personality that doesn’t exist, to create a lifestyle that doesn’t exist, to create a degree of integrity and honor and character that doesn’t exist. We live in a country where, no matter what you tune into today, one of the first questions you have is, “Did that really happen? Is that really real?” Because there is so little credibility at any level of so-called journalism today. So the way I look at the Manti Te’o thing, there are three possibilities to explain what happened. RUSH: On the Manti Te’o story, I have a question. First off, why is this such a huge story? Well, let’s look into this. This is the kind of stuff that interests me. It just sort of fascinates me. Why is this a big story? Why are the sports media so interested in either humiliating this guy or elevating him to superhero status, one of the two? Why are they so eager to dig as deep as necessary to find out if there was a hoax? Wouldn’t it have been nice if the same media had 5% of this type of curiosity about Barack Obama? Does the media do the same research on what good works the guy did or any other player does, or are we focused only on the potential screw up? I know our culture loves to elevate people and then rip ’em apart and tear ’em down. We still have not finished honoring a guy who got repeated Lewinskys in the Oval Office. That man today is still held on the highest political pedestal we have. Bill Clinton is still revered and loved and adored by the very same people who, if they can, will destroy Manti Te’o. Even if this girlfriend’s a fake — even if it was a hoax, if it’s a fake girlfriend — how is that a greater transgression than the dishonor that occurred in the highest office in this land and today is rewarded and celebrated and laughed about? The details are sketchy, but for a year Manti Te’o had this girlfriend he never met. It was an online relationship complete with knowledge of what she looked like. Other players claimed to know her. 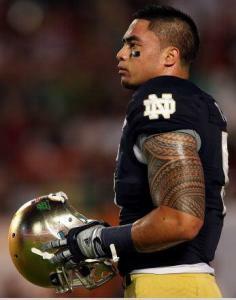 As far as Manti Te’o was concerned, goes one version, she was real, she existed, she loved him, and he loved her. These online relationships, what have you heard about people? They’re worried about Facebook and Twitter and so forth, that people are not learning to reality to each other interpersonally. Everything is taking place online. And then Manti Te’o’s devoted and beloved grandmother passes away, very near the eve of a big game. A week later the girlfriend dies! Manti Te’o’s girlfriend passed away. Oh, no. And he is suffering. He is depressed and he is distracted. The two greatest loves of his life, within a week’s time, have passed away, and yet he is expected to put on that uniform and get out there and trounce USC. Is the girlfriend hoax all about covering up the fact that he’s gay? Because of course there’s some prejudice in the NFL about that. RUSH: The media consensus apparently is that Manti Te’o was a victim of a hoax because he’s such a gullible guy, which they probably will get around to blaming on concussions where this before this is all over. You know, you get head injuries playing on the gridiron. RUSH: Very quickly, Manti Te’o. The media consensus is — and I’m saying that because this is what the AP story indicates, and I think the AP probably stands for/represents the media consensus. It comes down on the side of Manti Te’o being hoaxed by somebody. He was punk’d for a whole year. (interruption) “A victim.” Right. Good word. A victim. Somebody made fun of him. Somebody pulled the wool over his eyes. Somebody took advantage of his nice guy gullibility. Somebody portrayed a loving woman who was in love with him. He never met her; she never met him. There were never any conjugal visits. Well, they never met each other personally, but who knows what might have actually happened? I don’t know if he used Skype. I don’t know if there were ever any video conferences. It was over Facebook or Twitter or combination of two. It went on for a year, and then she died on the eve of big game. Now the athletic director at Notre Dame says (paraphrased), “Aw, this the finest man I’ve ever been around. This one of the most decent human beings ever, and now we’re all worried he’s never gonna trust anybody ever again.” The media consensus is that he was hoaxed because he’s so gullible. The media’s not gonna want to stop there. They’re gonna have to explain the gullibility. Why was he so gullible? Why was he so susceptible? Somebody had to know this about him before they tried it. They had to figure, “If we’re going to play a practical joke on somebody, let’s pick Manti. He’s the guy that would fall for it.” Why did they think that? “He’s such a nice guy, so gullible. He trusts everybody. Let’s show him what the world’s really like.” So the media will dig deep and probably end up blaming concussions, various head injuries. In other words, the game of football itself could be held responsible here for what happened to Manti Te’o. So those are the possibilities: That he’s in on it and created and participated in a massive spin scam to make himself out to be the greatest guy that ever lived and someone able to overcome obstacles and pressure and depression like nobody else — able to focus, too — which gonna make him look really attractive to an NFL team at draft time. Or he was punk’d and made fun of by a lot of people. Or that he’s gay. That’s the third theory. He’s gay and this is an elaborate cover-up. What better way to dispel that notion than to say he had an ongoing online relationship with his sweetheart for a whole year, and then she dies? Now, one other thing. There was at least one NFL player (for the Arizona Cardinals, I believe, a running back) who was online all year claiming he knows the woman, describing her physically as beautiful and tall and lanky. Meanwhile, ladies and gentlemen, no news about Algeria. TMZ and E! Entertainment have nothing on it. Nor does Deadspin. No news whatsoever. RUSH: There are Americans being held hostage in Algeria. You might have thought I was teasing about that in the first hour. TMZ and E! Entertainment Television are not reporting it. It hasn’t made it yet there, but it is happening. And we have drones flying over. It’s Al-Qaeda, which last I heard from the president around the time that Benghazi guy was going nuts in Libya, was that Al-Qaeda was on the run. But I think, what is it, seven Americans are being held hostage. So far no video has been found to explain it. And the president hasn’t yet announced a fundraiser in Las Vegas. There’s that poor Manti Te’o guy on TV. Yep. Notre Dame. He’s the perfect mark. I mean, he was the perfect sucker. The guy was Mr. Clean. The nicest guy in the world, the most gullible, believed, trust-anybody-guy in the world. And somebody ran a hoax on this poor guy for a year. He ended up having a girlfriend he never met for a year. No, no. Folks, in America today, in all candor, I think that’s entirely possible with as much social networking as there is and online connectivity. I mean, we read stories, and have, over people who are concerned and worried that people are losing the ability to relate interpersonally with people because their only interaction with them is electronic, digitally, Facebook, Twitter, MySpace, what have you. Meanwhile, the athletic director at Notre Dame feels very bad for the guy. He’s never gonna trust anybody ever again after having this kind of hoax. RUSH: You know this Manti Te’o story, it ends up here that the Drive-By Media ended up being scooped by the low-information media. In this case, Deadspin.com. Let’s go to the Today show today. The cohost Matt Lauer interviewing the assignment editor for DeadSpin.com, Timothy Burke, about breaking the Manti Te’o hoax story. See, the mainstream media ate it up. The mainstream media ate up the story, girlfriend he never met, died, great performance. The Deadspin guys and some of the others said, “Wait just a second, something about this.” And they started looking into it. The Drive-Bys did not. Here’s what Timothy Burke at Deadspin said. BURKE: On Deadspin.com today, my co-writer, Jack Dickey and I are gonna publish a full listing of some of the glaring discrepancies and contradictions in the reporting of the story of Manti Te’o and Lennay Kekua, his alleged girlfriend, that should have been an immediate red flag to anybody paying attention to college football news, that something wasn’t right here. We have five separate dates that she allegedly died in major media sources. Somebody should have noticed this. RUSH: Right. Five separate times she died in major media sources, and none of the major media sources dared or cared to look into it. Because they like the narrative. They loved the story, what a great guy, it was love for a full year. They never met and she got leukemia and she died, and, oh, my God, oh, my God. There were contradictions. There were signs all over the place. The Drive-Bys didn’t look into it. Here himself now, Manti Te’o, October 2nd, ESPN’s college game day. This is the Notre Dame linebacker talking about his girlfriend who he thought had passed away. And as you listen to this, realize she never existed. TE’O: Possibly the most beautiful girl I have ever met. She was just that person that I turned to and even though she was fighting leukemia and, you know, fighting various things, she always found time to serve someone else. When you have somebody that you talk to every single day, that you sleep with on the phone because she’s, she going through a lot of things and the only way that she can sleep is if she knows that you’re on the other side of the phone. And all of a sudden it’s silence, that silence really eats at you. And it’s, it’s, it’s eaten, it’s eaten at me and it continues to eat at me but, you know, that’s where faith comes in. RUSH: That you sleep with on the phone. The person he turns to for everything. She’s fighting leukemia, and she’s not there anymore. She never was there. That’s why people are saying, “Wait a minute, wait, did this guy really get this punk’d, or did he know?” In other words, was he part of it, creating this narrative and thus creating a great brand? It’s all about branding in American celebrityville today. It’s all about branding. How many women did you sleep with on the phone, Brian, before you got married? How many women have you slept with on the phone? Even after you got married. Be honest. RUSH: The guy that apparently is at the root of the hoax is Ronaiah Tuiasosopo. Apparently this guy designed the whole thing and perpetrated it and served as the representative of the family of the fake woman, and TMZ has the proof. Matt Lauer never got the proof, but TMZ had it. It’s there. So there.